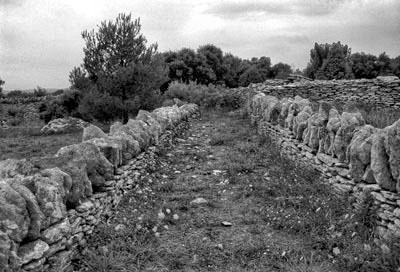 The slide show you are about to see has its origins in an ethnological investigation which I conducted first in December 1976, then in July 1978, on the site of a hamlet of dry stone buildings that is an outlying part of the community of Gordes in the département of Vaucluse. The area goes by the name of "Les Cabanes" in local parlance and is referred to as "le hameau des Savournins" in the 1809 land register and as "Les Savournins" in the 1956 land register. 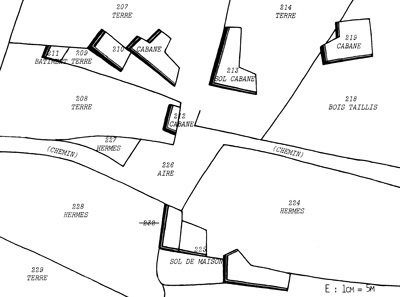 It is saddled today with the appellation "Village des Bories". 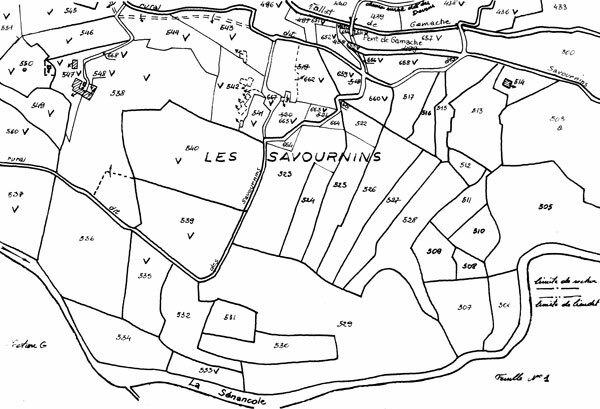 The "Village des Bories" at "Les Savournins Bas" is located 1.5 kilometres away (in a straight line) from the village of Gordes, in what the local people call today the "garrigue" (scrubland) or the "montagne" (hills). 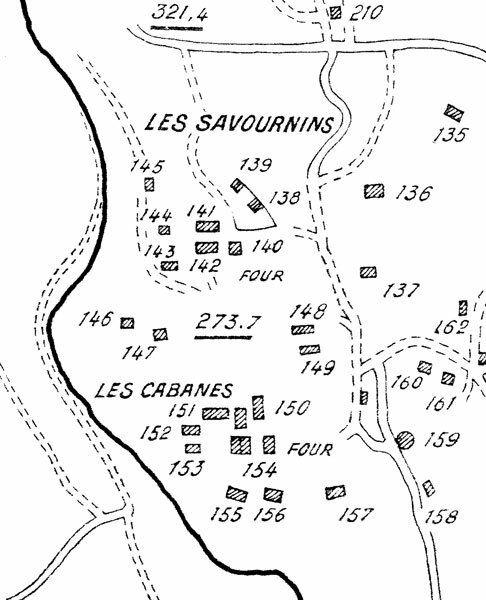 The buildings which it encompasses stand on a hill at an average altitude of 270-275 metres, between the Sénancole stream - its border to the West - and the Gamache vale - its border to the East. This so-called "village", in its present state, is the end result of ten years' clearing and restoration work undertaken by the owner, M. Pierre Viala, assisted by two hired masons. 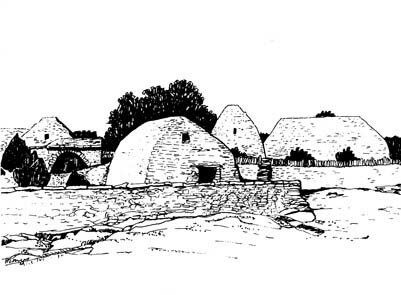 Now the site has been listed as a historic monument and is open to visitors for a fee. 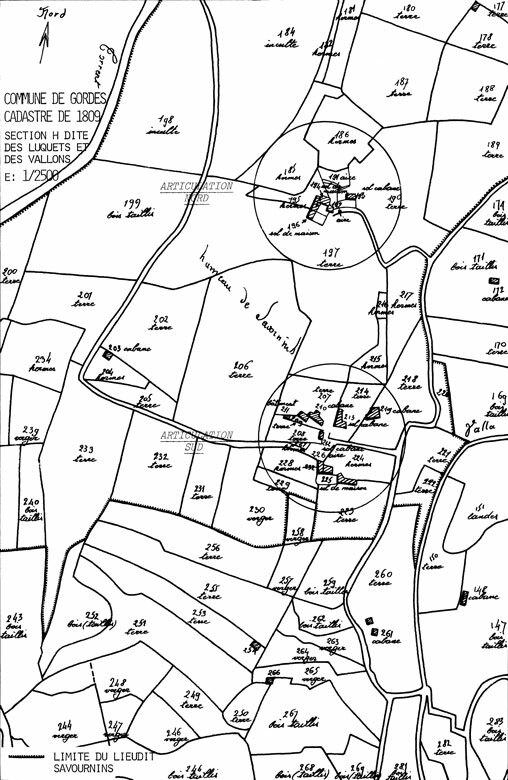 D - Map of the "village" and its "groups"
The "Village des Bories" is comprised of seven "groups" of cabanes, six of which are distributed across the area North of the lane that runs through it and only one across the area South of the lane. The guiding principle behind these so-called "groups" is Mr Viala's idea. 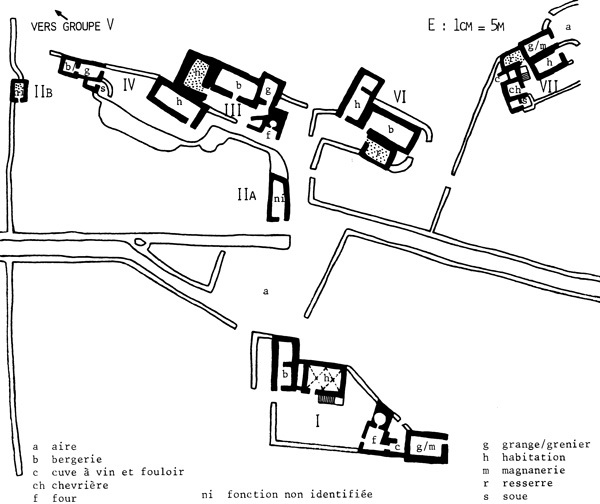 A "group" is to be seen as the reunion of two or more buildings, houses or cabanes, either abutting against, or adjoining, one another or in close proximity, while being related to one another with regard to the plot of land in which they stand, their layout, their functional complementarity, etc. For the sake of convenience, the numbering order used here is different from that of Mr Viala. A few buildings - those with dots inside - do not seem to be represented in the 1809 map (to be confirmed). 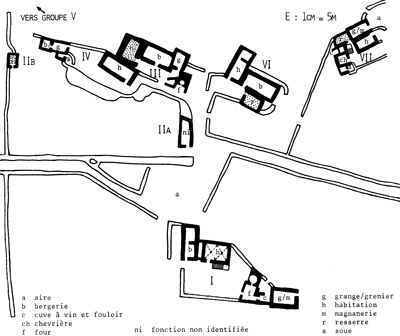 Although the buildings represented seem to be sketchily drawn (the subdivisions within each group being left out), yet their outline in a number of places betrays the absence of certain elements, for example the isolated cabane IIb, the dwelling house of group II, the store rooms of groups VI and VIII. 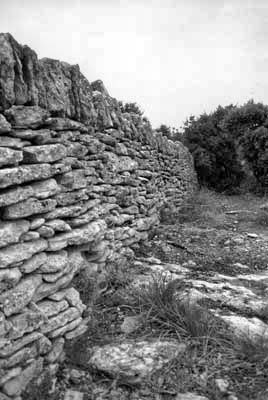 Opening the site to visitors has entailed the building of a high wall to keep intruders and vandals away. 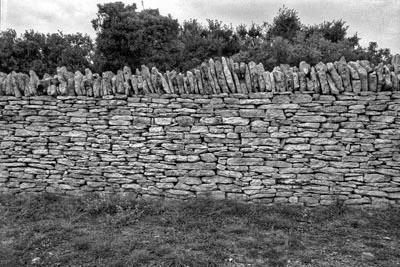 To comply with the local tradition, the wall has been provided with a coping of small slabs set on edge in order to lock the upper courses while discouraging any attempt at climbing over it. 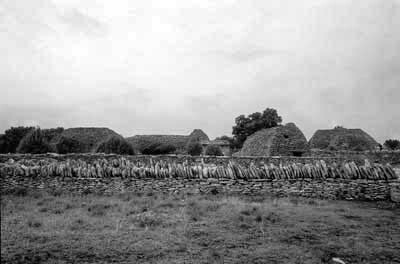 The site is crossed from East to West by a lane bordered by low walls, leading to the Senancole vale.